Vistara, completing its first year of operation this week, is seeing a positive outcome from tweaks to its network and the introduction of incentive pay to agents. The measures helped the airline to clock load factor of 72 per cent in November, its best ever since its launch in January. Vistara, a joint venture of Tata Sons and Singapore Airlines, was launched on January 9. The two promoters have infused Rs 600 crore in the airline according to the original funding plan. Vistara added two flights on the Delhi-Mumbai route increasing frequency to eight daily services in December. The extra flights gives Vistara a better opportunity to compete effectively on the busiest domestic route. While it lacks fleet size and network of its peers, Vistara is focusing on the Delhi-Mumbai route for growth. It has also added flights between Delhi and Goa and has withdrawn flights from the Mumbai-Ahmedabad route which did not attract enough passengers. Corporate sales are increasing and business from Tata group companies is also growing. From October, the airline has begun offering two per cent incentive to agents discontinuing its zero commission policy and this has led to improved sales. Vistara also has a sales network overseas and the airline said growth in bookings from markets, including Dubai, Japan and Singapore has been encouraging. The airline said it is looking to increase commercial tie-ups with foreign airlines and open sales channels in other markets. 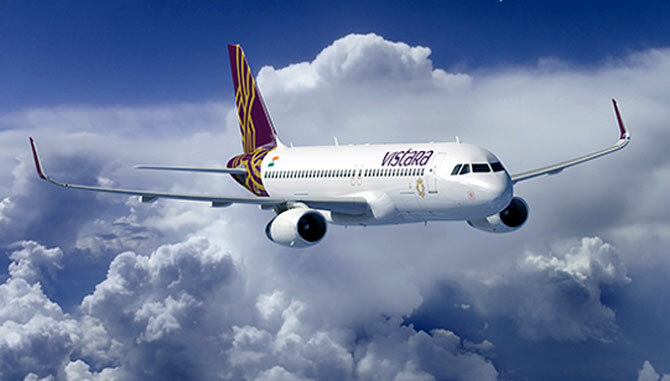 In November, Vistara reported loads of 72 per cent the highest since its launch in January. Vistara's average loads in the previous 10 months was 60 per cent, while the industry-wide loads in the same period were 82 per cent. In contrast, SpiceJet has been reporting passenger occupancy of over 90 per cent since May. The poor occupancy in Vistara aircraft has been blamed on the lack of network and good frequencies and its cabin configuration. It offers a three-class configuration (16 business class, 36 premium economy and 96 economy class seats). Other carriers in India either operate on a twin-class (business and economy) or an all-economy configuration. Vistara has now hired SpiceJet's Chief Operating Officer Sanjiv Kapoor as its chief strategy and commercial officer and analysts expect a rejig in Vistara schedules and greater focus on revenue management and promotions under Kapoor. Vistara will add four A320 planes this year adding to its existing fleet of nine planes. Also on cards is cabin reconfiguration and reduction in business class seats. The airline said it is yet to finalise new configuration and decide on number of aircraft which will see seat changes. “The induction of aircraft will enable us to expand our network by introducing new routes and also increase frequency on existing routes,” said Phee Teik Yeoh, chief executive officer, Vistara. The airline is evaluating destinations, including Chennai, Chandigarh, Kolkata, Kochi and Srinagar and is likely to add more flights on the Delhi-Mumbai route and its Delhi-Pune routes. Vistara said it has no immediate plans for a second hub. Currently, it parks eight of its A320s at Delhi and one in Mumbai. It has been unable to secure a bay for night parking in Mumbai and hence it is unable to add morning departures from the city. “We have designated Delhi as our hub at the same time we have always wanted to operate more services out of Mumbai but unfortunately the present infrastructure constraints at the Mumbai airport doesn’t permit us to do so. We are working closely with Mumbai airport authorities to resolve this issue. "It is too early for Vistara to be looking for a second hub but we don’t rule out this possibility when our fleet size grows,” said Phee Teik Yeoh. Next month, Vistara will open its lounge at Delhi airport and begin wireless streaming of entertainment content on board the aircraft. According to Kapil Kaul of Centre for Asia Pacific Aviation, Vistara has over the last year delivered growth with reliability and schedule integrity. “Operational preparedness has been as per expectation and customer feedback is positive. However, load factors and yields have been surprisingly below expectations with obvious impact on financials. “Vistara probably expected that the 5/20 rule may be abolished or rationalised when foreign direct investment rules were simplified. "However, the existing Indian airlines have successfully managed to tweak the issue from ‘protect the old boys’ to an ‘Indian vs foreign airlines’ issue, notwithstanding the fact that the Tata group own 51 per cent in Vistara. "The civil aviation policy may allow open skies for long haul routes beyond 5000 km. Hopefully the policy may also abolish the outdated, irrational and discriminatory 5/20 rule. "That may allow Vistara to coordinate with Singapore Airlines and provide global connectivity options to Indian and global passengers,” said Amber Dubey, partner and head of aerospace and defence at global consultancy KPMG. If Air India ceases to exist, who will be the biggest gainer?